We school year-round here at our house, but we do have an official start date for each new year. And I will admit that our summer school is a much lighter schedule with more fun extras like art and logic. So, when summer comes to an end, we add in our full schedule of subjects and get busy until we take our holiday breaks. But we do celebrate our first not-back-to-school day with a fun fun things. We have several fun traditions that we celebrate the start of each new year. We also start small. What I mean is, we only start with a few core subjects for our first few weeks back to school. Then each week afterward, we add 1 or 2 more subjects until we have our full load for the year. We begin our first week with only language arts (phonics, reading, grammar, handwriting) and math. The next week we add in Bible, writing, and poetry. The following week we add in history, with science and geography beginning the week after. By the fifth week we add in Spanish, logic, art, music, and any other extras that we have planned for the year. This allows me to focus on the core subjects first, making sure that we have ample time to review and then become familiar with our new curriculum for the year. Our slow start gives me time to adjust our schedule accordingly because it never fails that I have to change some subjects around as we work to find our new routine for the year. It also means that we have something new beginning every week for the entire first month. It’s fun to have a new subject added every Monday morning and it keeps school interesting and exciting while we try to get used to our new schedule. It also keeps me and my kids from getting overwhelmed with starting every subject on that first Monday. Let’s be honest: Our first day back to school for our new year is usually a little rough as we try to adjust to our new routine. Everything takes twice as long for the first few weeks so I like to give myself a little grace and start very slowly to ease into our new year. Our staggered start-up schedule has worked wonders these past few years! 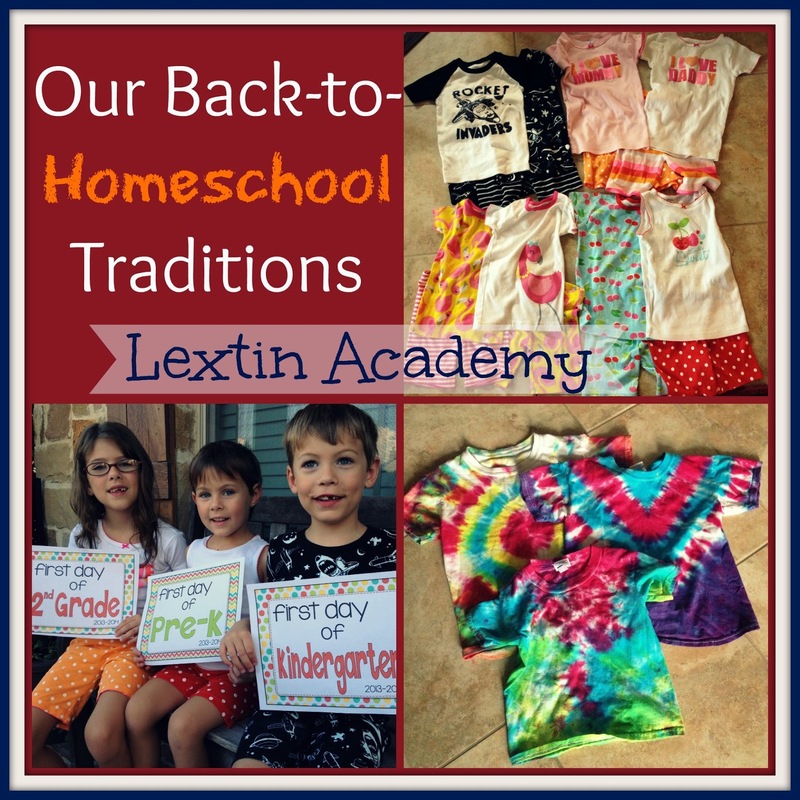 See how the rest of the Crew celebrates their first days of school with the blog hop! tie dye uniforms — how fun is that? Tye dye uniforms sound super fun and very hippy-ish. LOL Looks like a great start to the year! How fun are you?! I love reading about other families who are year rounders. I never thought we would be, but here we are. I like to take all of December off and then May. May isn't hot yet where we live and everyone else is still in school so places aren't busy! 🙂 I bet your kiddos LOVE your traditions! Love the new pjs. What a fun idea. Hope your new school goes great!